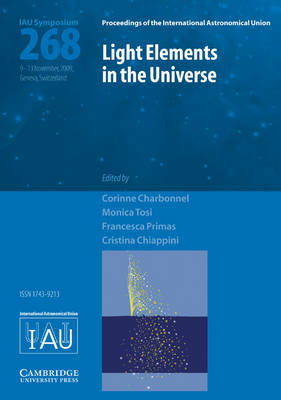 IAU Symposium 268 presents an overview of the most recent observational and theoretical research on the formation and evolution of light elements in the Universe: H, He, Li, Be, B, and their isotopes. Astrophysicists from a variety of subfields discuss recent developments that will improve our understanding of the light elements and provide important clues to stellar and galactic evolution, Big Bang nucleosynthesis, and cosmology. Striking observational progress has been achieved recently through the advent of next generation ground- and space-based telescopes, such as the cosmic microwave background experiments that allow the accurate determination of the baryon density of the Universe. New theoretical breakthroughs in describing stellar interiors and the chemical evolution of complex systems and the remaining challenges in this field are also addressed. This critical review is a useful resource for all those interested in the chemical evolution of the Universe.